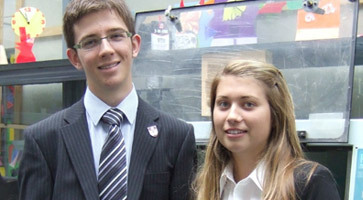 Two L6 students, Alex White and Vicky Greenwood, have both been awarded Arkwright Scholarships. To achieve the scholarships, Alex and Vicky had to go through a complex selection process. The first stage was an extended application form, in which they had to describe their GCSE technology project and to explain how engineering interests them. Next was a two-hour exam, focusing on the design stage of a system. This was followed by an interview at Loughborough University, renowned for engineering. Arkwright Scholarships for engineering, named after the 18th Century engineer, Richard Arkwright, are given to pupils studying A Levels. Engineering companies give £1,000 per scholar of which £400 goes to the school, £500 is paid to the scholar over a period of two years and the remaining £100 goes to the Trust. Photographed in the GSAL ADT department are Alex White and Vicky Greenwood.